Even though St. Vincent has absolutely nothing to do with the Christmas holiday, nor is it even set around that time of year, there’s something about it that has all the qualities of a classic Christmas film. We’re not joking. Think about it: the story is of a crotchety old man who wants almost nothing to do with the world around him, until a certain young presence – a spirit, if you will – comes into his life and shows him the meaning of goodwill to others, with only his selfish nature threatening to get in the way of everything, and by the end of it all he will have changed in one way or another. Any of that sound familiar? 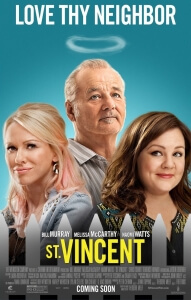 That’s right, we’re suggesting that St. Vincent, a Bill Murray comedy that’s set neither at Christmas or any other definable holiday, is an extremely loose adaptation of Charles Dickens’ A Christmas Carol. Of course, if this were intentional, it would be Murray’s second comedy based on the classic story (the first being 1988’s Scrooged) but by far the least conventional portrayal of Dickens’ Ebenezer Scrooge. Though his Vincent, a retired war veteran with a penchant for horse race betting and getting hammered in bars, is not the ideal character that Dickens was going for you can still spot similar traits one usually associates with the character; a grumpy and mean nature, a virtual recluse, a general disdain for everyone else around him, and so on. As ever, Murray is highly fun to watch in the part, even if it’s just because we miss seeing the former Ghostbusters actor feature in a starring role, and when the film moves into some of its more sentimental moments it all serves as a reminder that, along with his Oscar-nominated turn in Lost in Translation, the man can do a damn good dramatic performance every now and then. However, that’s only one element connecting it to A Christmas Carol – what, you may ask, about the spirits of the past, present and future? Well, again, the movie handles all of that in a very unique manner. The “past” can be connected to Vincent himself; going in, we don’t know that much about him but it is implied that something that happened to him in his own history that caused him to end up the way he is when we first meet him. Throughout the course of the film, we learn about his past experiences in the Vietnam war and – in an uncharacteristic venture – how he visits his dementia-stricken wife in a retirement home posing as a doctor. We learn more about who he is as we go on this journey, and how his past needs to be overcome in some way in order to become a better person to others and, most importantly, to himself. The “present” comes in the form of his new neighbours Maggie (a subdued and, after Tammy, all the better for it Melissa McCarthy) and her son Oliver (young newcomer Jaeden Lieberher, a likable kid). Going through some rough patches of their own, including a lengthy divorce for the former and the need of a father figure for the latter, they soon depend on the reluctant Vincent to somehow help them through their problems even though it seems he doesn’t care in the slightest (and, for a while, he doesn’t). She needs a babysitter for Oliver while she’s swamped in work at the hospital, while Oliver needs some advice on how to handle bullies at his new school. Vincent manages to help them in his own peculiar way, at first for selfish reasons but soon starts to truly connect with the young boy and learns to come more out of his shell, just as Scrooge does when he sees the joyous nature of people on Christmas Morning. You could call Oliver the Tiny Tim figure, but we’d prefer him to be compared with Bob Cratchet, a do-gooder who puts up with the backlash from his mentor and comes out of it all with the same positive nature and love for others as before. So that’s two, but what about that all-important “future” spirit? Oddly enough, that role falls to the least likely person you could imagine: Naomi Watts, as a pregnant Russian stripper who Vincent often associates himself with. Her unborn baby represents the life that’s coming into the world as it will be by film’s end, and since it’s established that Watts (who, despite the dodgy accent, isn’t that bad here) does not have much support outside of Vincent, the responsibility once again falls upon him to set an example and create a stronger and more accepting world that the baby can grow up in. Vincent, whether he likes it or not, is the centre of everything that happens in this movie and much like Scrooge it is up to him to change his ways for the sake of all those around and, most importantly, for himself. 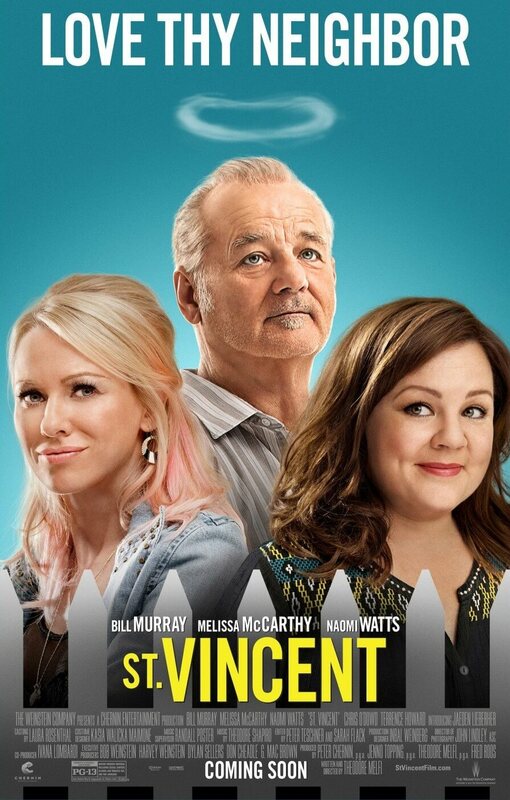 With all those allegories and connections out of the way, how does St. Vincent hold up as its own movie? As it turns out, it’s still a very likable movie with good performances and strong poignant messages here and there. There are some things that don’t work, such as a tendency to become too schmaltzy in places, especially in the predictable third act, and to include a host of underdeveloped and unnecessary characters (Chris O’Dowd, as a teacher at Oliver’s religious school, has nothing to do in contributing to the plot, and Terrence Howard might as well have not been in the movie at all). But all in all, even though its December release may seem just a coincident, St. Vincent may surprise you in just how Christmas-y it can really be.